If you only make one thing from my blog, please make this. Please? I’m begging and pleading and groveling and I’m not ashamed to admit it. 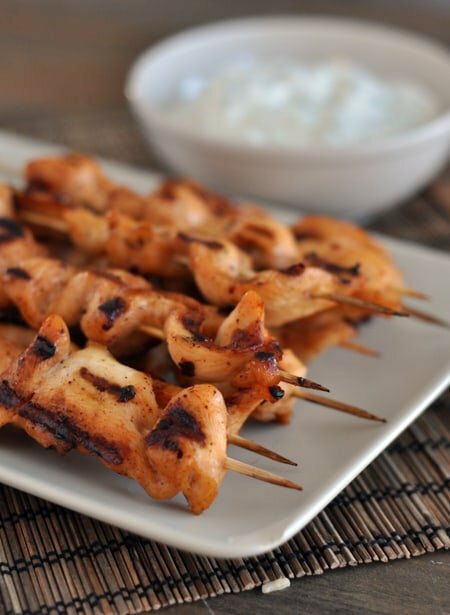 Because these chicken skewers are amazing. Like, knock-it-out-of-the-park amazing. I was a little worried about the spice level because I’ve used chipotle chiles in the past and while I love the flavor, the heat is a bit much for the kids (and sometimes me, to be honest). But in this recipe? It works. Really, really, really works. 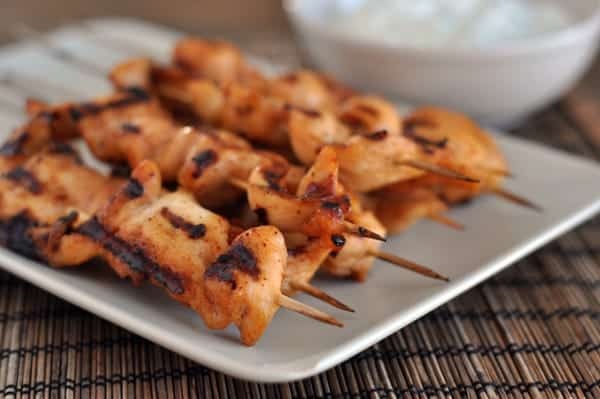 The grilled chicken skewers pack a bit of spice (which you can dumb down even more by scraping the seeds first) but dipped in the cool, creamy sauce and it is like an instant cooling pool party on your palate. A perfect light, healthy dinner for the warm months ahead, I am not exaggerating when I say I could eat this every night for a week and still be craving it come the next Monday. The tender chicken is a perfect marriage of sweet and heat and is so refreshing and tasty with the dipping sauce that it nearly left me speechless. Except my one real talent on this earth is that I’m never speechless. Close call only. To say this was well-received amongst the family is an understatement. I had to cut my two oldest boys off after four skewers apiece. I mean, a mom needs her protein too, right? Oh, and by the way, I served these with the golden skillet potatoes of yesterweek which made the already fabulous meal absolutely exceptional. Three Years Ago: Giant Cookie! Slice the chicken breasts into long, thin strips, about 1/2-inch thick. You should have right around 30 strips. In a small bowl, stir together the brown sugar, cilantro, chipotle chile, adobo sauce, salt, chili powder, garlic powder, and pepper. Toss the chicken with the brown sugar mixture coating all the pieces evenly. Cover the chicken (or place in a ziploc bag) and refrigerate for at least 30 minutes and up to 24 hours. For the dipping sauce, in a bowl, stir all the ingredients together. Cover the mixture and let stand at room temperature for 30 minutes until the flavors combine. 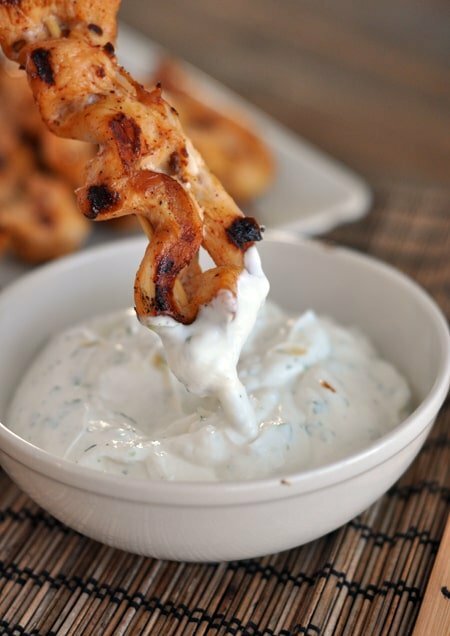 Alternately, you can make the dipping sauce in advance and refrigerate for up to 2 days. Be sure to season the dipping sauce with additional lime juice, salt and pepper to taste before serving. 30 minutes before grilling, cover the bamboo skewers with water and soak. Skip this step if using metal skewers. Preheat an oven broiler or gas/charcoal grill. Weave two strips of chicken onto each skewer. Broil or grill the chicken for 5-8 minutes until cooked through, using nonstick cooking spray on a foil-lined pan if you are broiling. Serve immediately (if you broil, you may need to cook in batches) with the dipping sauce. You could definitely use full-fat sour cream or mayo/yogurt, but I'll attest that the sauce was divinely yummy made with reduced fat ingredients. Chipotle chiles in adobo sauce can be quite spicy so if you want to knock the spice down a bit, scrape the seeds out of the chile and discard before mincing the chile for the marinade/dry rub. Last night I made dinner almost completely from your website by pulling a bit of this and that from different posts. We had this chicken (which I marinated and grilled in whole thinly sliced breasts rather than skewering) and served in warm flour tortillas with slices of avocado, chopped tomatoes, and those amazing pickled onions from your marinated fajita recipe from last week. I had half a jar of your creamy cilantro lime dressing leftover from another meal (FAVE – thanks SO much-LITERALLY could drink it with a straw) and so we topped off those beauties with it. Alongside was your easy homemade cilantro lime rice and some smoky black beans I threw together with onions, garlic, poblano peppers, tomato paste, smoked paprika, a little orange zest and, of course, cilantro -I dunno about you but I’m seeing a pattern here, JS. WHAT a meal – flavorful, satisfying, just delicious. Thanks so much Mel – you’re the BEST! Holy cow, Lisa – wish I had been eating at YOUR house! Sounds amazing! Loved the chicken! Marinade was delish. I didn’t love the dip though. I don’t know if it was too limey. We loved this!!! Will make again soon – kept a couple seeds only – was perfect spice for kids! Yummy! Maybe I needed to marinate longer, or the thighs didn’t hold on to the flavor as well, but I could have used a little more of that chipotle flavor. Also, thighs are no fun to skewer, haha! Definitely making this again though, mmm mmm mmm. I have a few questions. Can I just leave the cilantro out, or should I try and replace with a similar flavor? And also, what on earth do I do with the remaining chipotle? Hi Diane – yes, you’ll need to cook longer for chicken thighs – probably an extra 5-7 minutes (use an instant-read thermometer if you can). All ready to throw the chicken on the grill and we discover the grill has kicked the bucket…wondering what the best plan of action is now…cast iron skillet? Broiler?? Thanks for the quick response…my guy saved the day with the grill…he’s a keeper…chicken and sauce was super yummy…also a keeper…thanks so much for all you do here…I don’t bother looking anywhere else when I need a recipe…you’ve never let me down! In the America’s Test Kitchen “The Best Light Recipe” 2006 edition cookbook, which contains this same recipe, it says to use the broiler. Line a pan with aluminum foil and place the rack on top. Be sure to grease the rack with cooking spray so the chicken doesn’t stick to it. How many days can I still use the sauce?? It depends on how fresh the ingredients were that you used for it but I’d say up to a week. I’ve made this recipe so often over the last few months that I have it memorized. It’s one of my families favorites. We like it so much we served it at a BBQ with guests and everyone wanted the recipe. Thanks for sharing! I made these for dinner last night, I didn’t have skewers, so I just cut the meat up like fajitas. I had it marinading for 24 hours, & I added bell peppers & grilled onions to make them like tacos! These are killer, such a great flavor! Thank you! Once again, you come through with an awesome recipe that left people in awe of my cooking. You make me look so good. We all thank you! These chicken kabobs were amazing. Oh and we don’t currently have a grill so I just broiled the chicken and it was delicious. I made this recipe last week for the missionaries and it was a huge hit! I scraped out the seeds and there was no spice to the chicken, so today I am going to make it with the seeds. My husband put the creamy sauce on his baked potato and loved it! And I can’t stop thinking about eating the chicken and sauce with naan. This chicken has become a favorite in our house this summer! I’ve made it at least 3 times this month and we’re not tired of it yet. Thank you for such a delicious recipe!! Made these last night with the full amount of spice and it didn’t scare anyone away. These were absolutely fantastic. We rate new recipes in our house on a scale of 1-5 and keep the scores for future reference. My two boys and hubbie all rated these a 5.5! Me, I would rate them a 6 because nothing has ever scored a perfect 5 or above across the board before. Well done! p.s. I used pork tenderloin instead of chicken, which my 12 yr old does not usually like, and the recipe was delicious! These were amazing! My new favorite dinner! Holy moly! I made these with pork chops that I skewered and it was quite possibly one of the best things I’ve tasted in a long time! Thanks for such a great recipe, Mel! Made these and they are awesome. Everyone liked them. Perfect blend of spicy chicken and cool sauce. The only complaint anyone had was that I didn’t make enough. I would suggest keeping a bit of chopped chives or some of the green onion bits on the side and sprinkle it over the top of the dipping sauce for visual appeal. I doubled this recipe for 8 adults and everyone loved it! 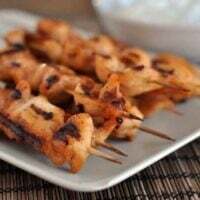 The marinade is really easy and not too spicy. I made it mild since it was the first time. I will spice it up a little more next time. The dipping sauce is oh so good but it was even better the next day, so I will make it a day ahead next time. This would make a great super bowl party addition which is coming up! (One hint I have for cutting chicken into strips is pampered chefs kitchen scissors. I love,love.love these. My husband does too, since he cut all the chicken. The sharp scissors trim off fat and cut through the breast so easily! My favorite chicken tool! Thanks Mel for a keeper!! Love love love. Remember the old Farberware Indoor grills? I still use mine, and this recipe is perfect on the ‘ol Faberware. They made them in the late 1970’s. What an easy recipe to throw together! Delish! Next time I will make less sauce (though I like the suggestions for using leftovers) and would reduce or eliminate the brown sugar, as I am not sure I really cared for sweet chicken… Overall, a very flavorful and appealing dinner! I just made these again tonight. They are so good, I could probably eat an entire batch by myself! But alas, I have to share with the rest of my family. 🙂 I didn’t have any skewers available tonight, so what I did was cook them on one of those disposable grill grates (like the kind you could grill veggies on). We had to do it in batches, but it worked! I can’t wait to eat the leftovers tomorrow (by myself!). I am a serious long time fan of your Grilled Island Chicken recipe but now I’ve had two other grilled chicken recipes on your site in the span of a week that threaten to unseed the Island Chicken from its “most frequently made” spot! This chipotle chicken is completely amazing (the other is that incredible Grilled Lime Coconut Chicken). I cannot believe how a few hours in this simple marinade completely transforms chicken. It’s juicy, it’s full of flavor and the spicy sweetness is so good. My only regret – not doubling the recipe because there are NO leftovers! Thanks Mel! Thank you , Mel. That’s exactly what I did last night. Oh my goodness, these are the bomb. You have many fantastic recipes but I think these may very well be our favorite. We couldn’t stop eating them. This recipe will most likely be a weekly dinner at our house. You’re right on the mark when you say if we are going to try just one recipe from your site, this has to be it. Thank you ,thank you. Super-delicious. These sound divine. One question: in the dipping sauce, do you use the white bulb as well as the green tops of the onion? Hi Beth – I use mostly the green parts but probably a slice or two off the white part, too. Do you think these would work well with chicken thighs? I don’t cook with them often, but there was a great sale on them this week, and I REALLY want to try this recipe. Lynne – yes, I think this could work great with chicken thighs! I made these when our soon, Brian was home. We loved them so much we made them two days later. I broiled them and they turned out fabulous. We also love the dip that accompanied the recipe. I will make these again and again! Made these tonight…amazeballs. Seriously. The best chicken I’ve had in a really long time. I actually almost preferred them without the dipping sauce, too, because I thought the sauce masked too much of the chicken’s flavor. This was SOOOOOO good. And easy to make on a weeknight too. Delicious. You should get a book deal. I never buy cookbooks, but I would buy yours. I made these last night. They were wonderful! Everyone in my family loved them! I added an extra chipotle because I like things extra spicy. I also served a Thai peanut sauce along with the amazing creamy dipping sauce. I will be making this one a lot! Made these tonight! Loved them!!! My kids are picky & I was worried b/c they are a little spicy, but we just coated the kids’ chicken in the sauce & they ate it just fine. When my son eats anything, it’s a winner! Will be making this again for sure! Thanks Mel! Made these this week and they were FANTASTIC! Best meal I have made in a while….thank you!!! Thank you for the sauce ideas. I’ve been craving that sauce since I had it!! Tonight I’m going to try it on a ramen noodle slaw recipe that also has Romaine, in place of the usual dressing. Might be bizarre, but if dipping veggies in it works, why not!? Amazing. So good I was nervous about the heat (ketchup makes me sweat) but these were perfect. Hubby and I loved this! So delicious! No chipotle chili at store so bought them in adobo sauce – fished one out deseeded minced and then added 2 tsp of the sauce and it was perfect. You are right on point. Absolutely tender, succulent, and delicious. Kristen (post 5-22) asked what else she could use the sauce on…..I put it on my crock pot baked potatoes (a wonderful meal for the upcoming HOT and HUMID summer months….no need to heat up the kitchen). I also grilled some corn on the cob. But this chicken is THE BOMB! So, so, so tasty. DELICIOUS!!! Thank you so much for posting this recipe! I made it tonight and they were seriously awesome!!! Next time I’m doubling the recipe! 2 of my boys were at friends’ houses tonight but if they were home, we definetely wouldn’t have had enough as I’m sure they would’ve devoured them! Made them tonight and we all loved them, thank you! Just made these for dinner, and they were delish!! Next time I might leave the seeds in for a little extra heat, but none the less, extremely yummy, and I’ll be making these again soon. Tracey – if you can find any other kind of smoky chile pepper and spicy sauce, you could probably substitute. I’m not familiar with what you do have in the Middle East so you’ll probably have to experiment a bit. Made it. Ate it. Loved it. This is going in our family’s rotation! Thanks! These were AWESOME!! We had no chicken leftovers, and I could have eaten more! Question – what else can I do with that fabulous sauce, besides sit down with a spoon? Kristin – I love the sauce on my tortilla/wrap rollups that I eat for lunch (anything from chicken to vegetarian to ham). It’s also great for dipping veggies, in my opinion! So I took your advice and made these tonight. So unbelievably good. Totally hit the spot, had all the ingredients on hand and it took no time to prepare. Thank you for this gem of a recipe!!! Love love love it! Made these tonite and they were AMAZING! Ate leftovers for lunch today…..what a treat! The sauce really makes the recipe. I think next time I will plan ahead and give everything 24 hrs to marinate/meld. My chicken & sauce only had about 1.5 hrs. That will really take it to the next level. Planning for company this weekend and these will be perfect……restaurant tasty from my kitchen! WootWoot! I don’t believe I’ve seen adobo chili’s in sauce and I’ve looked since I’ve been following your blog as some recipes call for it. I wonder if you have Canadian blog followers that might have a suggestion on where to buy these and/or what I could sub it with? Mel, holy wow Mel, I made these tonight and I went crazy eating them. Really. Crazy. This was one of the best new recipes ever. A million thanks. That cream dipping sauce! That tender sweet heat chicken! Divine. I wasn’t even going to click on this post because the spicy title scared me away. However, you hooked me with all your begging and I am pinning this to make later! I put chicken breasts out this morning to thaw but had no idea what I was going to do with them. Then, I did my morning “Mel’s Kitchen” check in and immediately knew what I was going to do with the chicken. As an added bonus, I even had all of the ingredients on hand. Grand slam! My husband was oo-ing and ahh-ing in between every bite! The kids loved it, too, and all were staking claims on the leftovers for tomorrow’s lunch. They sure are all going to be disappointed when they find out Dad ate the rest after they went to bed. ) This is definitely a keeper. Easy and so full of flavor – my idea of a perfect recipe! Thanks, Mel. YUM! I think this is tomorrow’s dinner! I use the chipolte peppers in adobo sauce in our favorite corn chowder so I am glad to have another recipe for them, especially one that is more hot weather friendly! These are going on the menu plan for Thursday. 🙂 Thank you! I cheated…for others considering the same…I’m sure that they taste even better grilled, but I cheated and skipped the skewers, cooking it all up in a large sauté pan instead. The flavors looked too good to pass up but I didn’t have time for the grill. Served it over rice with black beans, avocados, tomatoes, cheese and Mel’s yummy dipping sauce and it was outstanding. My toddlers loved it too — not too spicy and great flavor. Might even increase the spice mixture next time if not getting the grill flair. Off to have seconds now! My mouth is watering and my tummy is rumbling just looking at these. Thanks for sharing! I believe you on the deliciousness! These skewers look great! My college son will be home for part of the summer and he likes his food a whole lot spicier than the rest of us. (Hence, the siracha sauce he puts on EVERYTHING). I will be making these skewers seeds in for him and seeds out for those who like flavor but not fire. Thanks! Wow do these ever look mouthwatering, Mel! That sauce is calling to me! Just a quick tip: I never use all the chilies from the can in one recipe, so i make squares out of plastic wrap and on each square I place 1 chili and a little of the sauce. I individually wrap each chili, then place them all in a ziploc bag in the freezer. They defrost in only a few seconds, and I always have them on hand (we love using them in the chipolte chicken tacos). Now to use them in this recipe-yum! You convinced me, I’ll make these this week! They sound delicious. Guess who happens to have a can of open adobo chilis that I couldn’t figure out what to do with? That’s right… me! Thanks for the idea! Just, yes. I shall be making these and hoarding all the skewers for my lonesome. No sharing!! Ohhhh…. I need to try these!!!!! Oh wow, these sound amazing! I’m going to have to try these tonight!